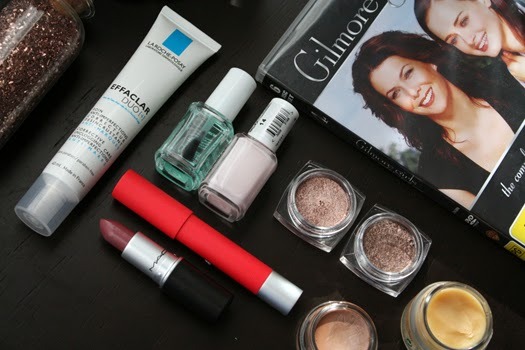 It's April Favourites time again. This month it's been all about the mattes, the neutrals and some skincare staples. There's even some nail gems and a series I've had on repeat this month in the mix too. Here's what I've been loving throughout April..
Mac Paint Pot in Groundwork*-If you've been reading Nana Wintour for a while you'll know I'm quite fond of Mac's Paint Pots. Groundwork is a mid-toned taupe and on the lids it looks quite warm. If your eyeshadow is prone to creasing then this is a great base to help your eyeshadows stick around. I like to wear this on lazy days with a bit of bronzer in the crease too. It looks like you've made a bit of an effort in the morning #cheatsmakeup. Essie Nail Colour in Fiji-An off-white pink that is one of Essie's bestselling shades. It doesn't apply streakily although you will need at least two coats if you want it totally opaque. Essie's polishes seem to last really well on the nails and have a glossy, gel nail-esque finish. Nuxe Reve De Miel Honey Lip Balm-Reve De Miel is a beauty blogger favourite and it is easy to see why. It's not just the frosted glass jar that does it. If your lips are prone to looking a bit worse for wear in Winter then you need this in your life. It has quite a thick texture but once it's on your lips it dries matte. You only need the smallest amount and your lips will be thanking you the next morning. It seems pricy but you get a fair amount of product and a little goes a long way. L'Oreal Infallible Eyeshadows in Bronzed Taupe and Amber Rush-These eyeshadows have been well loved this month. Formula-wise they're more of a pressed pigment, but they have the pigmentation of pricier eyeshadows. They're stunners and look amazing paired with loose glitters and lashings of mascara. Mac Lustre Lipstick in Syrup, a Back 2 Mac score-Is there anything better than going to Mac and not having to pay for your lipstick? Syrup is a very wearable neutral pink that leans more on the plummier side of things. If you're not a fan of brown-based nudes then you should go give this one a swatch. Being a lustre finish means it applies creamily and doesn't feel drying on the lips. Essie 'First Base' Base Coat*-For years I have been using a top+base coat hybrid which is okay, but nothing to write home about. As any nail enthusiast will know though a good base coat will make all the difference. I use this along with a nail treatment and it really makes such a difference. Your polish applies and adheres to the nails much better. It helps that it's a pretty turquoise colour as well. Revlon Colorburst Matte Balm in Unapologetic-Revlon were on to a good thing with their matte and lacquer balms. I loved this shade this month. One swipe across the lips gives you full colour payoff and it has fabulous lasting power. Be sure to use a lip balm or lip scrub before wearing this if you want it to sit comfortably on the lips though. La Roche Posay Effaclar Duo [+]-The Effaclar Duo has become a staple in my skincare routine over the last two months. I really notice a difference if I forget to use it. This is designed to reduce the appearance of acne scarring and shine, both which it does effectively. It has a lightweight formula too and the scent reminds me of Origins GinZing, very uplifting! Psst, it's currently on sale over at Escentual. Walk, don't run..
Gilmore Girls Season 4-The Gilmore Girl obsession continues. I'm still on mid-semester break so in between the assignment madness there's been plenty of episode watching taking place. I love Gilmore Girls-it's definitely getting up there with Gossip Girl for one of my favourite shows ever. I'm not sure I'd say this is my favourite season so far but it's the most recent one I finished. -What have you been loving during April? Do you have it too!? It's so beautiful. Fiji is one of my all time favourite polishes! And the L'oreal shadows are the bomb! I've been trying to get my hands on Amber Rush for a while now with no luck but bronzed taupe is gorgeous! I've been searching my local drugs store for that Nuxe lip balm with no luck but found out that Walgreens sells it online. Will def. be purchasing it. Oh no! I found mine online. We can't get either of those shades here in New Zealand. You'll definitely have to pick up the lip balm. It's such a staple, especially in Winter!